If you find yourself spending your days slipping on banana peels you inconveniently placed yourself, or if you find yourself vaulting over the fence in your yard to throw pies at unsuspecting neighbors, or you spend hours in front of the mirror every day, caking your face with so much makeup it ends up looking like paint, then—well, you have a problem. The good news for you is that you have a very specific problem, unlike those chumps who can't find love or are trying to invest in the stock market. For this dilemma, meanwhile, you have but two options: You can stuff your bags with all your red noses, wigs, and prank props and hoof it to clown school, or you can simply dress the part and get back out to doing your thing! We've got the hook up if you're partial to the latter. 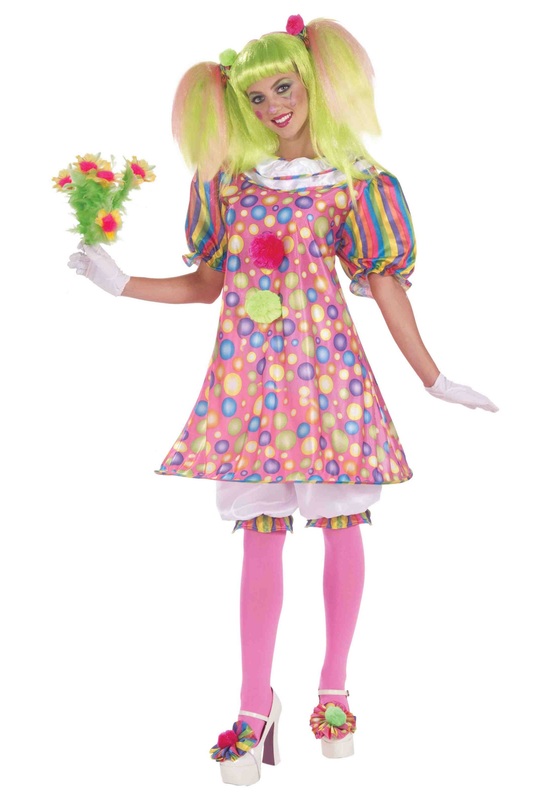 Bottom line: this silly behavior means you're a clown at heart at the very least, and the only way for you to ever be happy is to put on a wacky costume like this—ideally, paired with a set of big floppy shoes. They would match the pink satin polka dot dress, the matching hair scrunchies, and the oversized hoop-skirt... Well, as much as anything could match big floppy shoes. Make us proud, you glorious, awkward clown. Don't forget us when your face is plastered on circus posters across the nation!